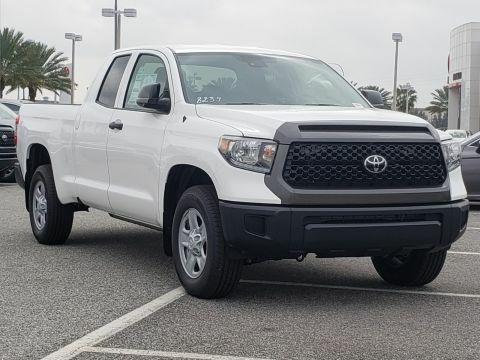 0.0/0.9/1.9/2.9 annual percentage rate financing on new 2019 Tundra, excludes TRD Pro, with respective terms of 36/48/60/72 months. This offer applies to well-qualified buyers and requires approved credit and financing through Southeast Toyota Finance. Not all buyers will qualify for these rates. Payments may be deferred for the first 90 days; interest accrues from inception. Monthly payment for every $1,000 financed is 0.0% - 36 months = $27.78; 0.9% - 48 months = $21.25; 1.9% - 60 months = $17.54; 2.9% - 72 months = $15.22. No down payment required. Excludes tax, tag, registration, title and dealer fees. Dealer fees vary by dealer. May not be combined with certain other offers. Must complete retail sale and take delivery between 04/02/19 and 04/30/19. Listed Incentives are available for registrations at Toyota of Orlando located in Orlando, FL. Information Provided by Toyota Motor Company: Information is Reliable but not guaranteed. Finance Offers (APR) are available to qualified buyers subject to Credit Approval, not all buyers will qualify.